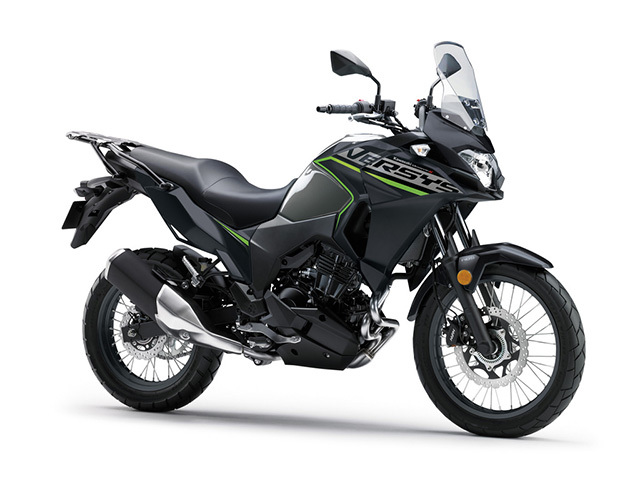 The VERSYS-X 300 is an adventure-styled touring model that builds on the any-road any-time performance of Kawasaki's VERSYS models by adding increased capability on unpaved roads. 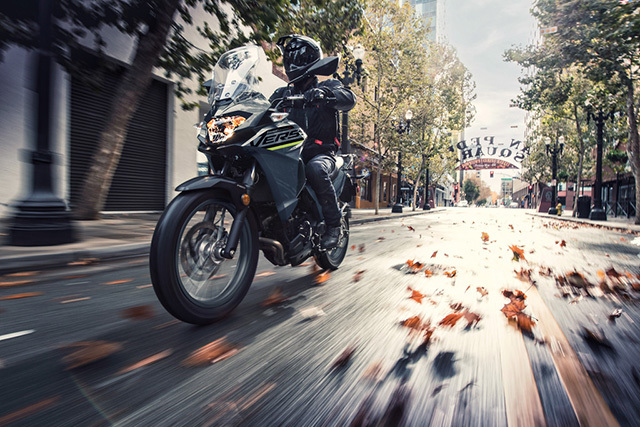 At 300cc, the VERSYS-X 300 is the smallest-displacement model in the touring category, and the only model of its kind. Like you would expect from a bike designed to be the ideal travel partner, it offers the best comfort and convenience of any 300cc model. 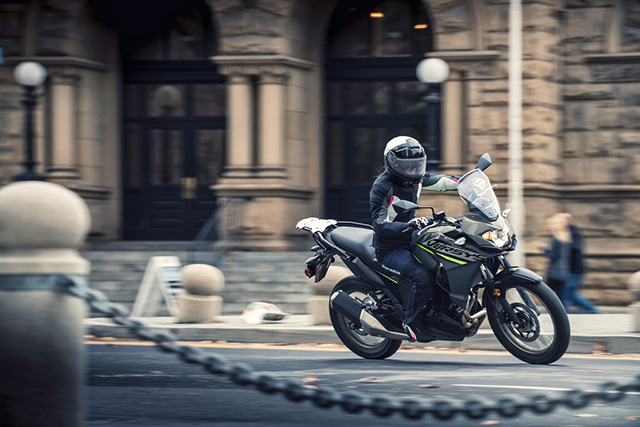 More manageable in both weight and power, and more readily available than many larger-displacement models, the VERSYS-X 300 offers easy access to motorcycle adventure. A wide range of accessories are available: all the equipment necessary for comfortable long-distance riding. Liquid-cooled, DOHC, 8-valve Parallel Twin delivers smooth, responsive power at low and medium rpm and hard hitting power at high rpm. Already smoother than a single-cylinder, the engine features a balancer to help dampen engine vibrations, contributing to a very smooth ride feel as well as comfortable cruising. Dual petal disc brakes (290 mm petal discs at the front and 220 mm at the rear) provide sure stopping power. In addition to the very effective petal disc brakes, customers looking for added degree of reassuring braking performance will find standard ABS fitted front and rear. Compact new Bosch 10M ABS unit contributes to both weight and space savings. The combination of a tall upper cowl design inspired by adventure models, and a large-size windshield provides superior wind protection, adding to long-distance riding comfort and contributing to adventure-style looks. resistant stainless steel, contributes to low- and mid-range performance and a smooth, step-free power curve. 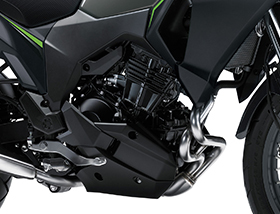 Exhaust header pipes ø31.8 mm diameter on the Versys-X 300 are optimised for low-mid range performance. With ground clearance on unpaved roads a design consideration, their elegantly curved shape keeps the headers close to the engine. Single honeycomb catalyser in the collector pipe contributes to clean emissions that clear Euro 4 standards. Short-style right-side silencer is positioned away from rider and passenger. Relatively short gearing offers a balance between fuel economy and low-mid-range power feeling and response. A long 6th gear contributes to the high-speed cruising range. Range (measured per WMTC Mode) on a single tank exceeds 400 km, allowing significant time between refuelling stops. 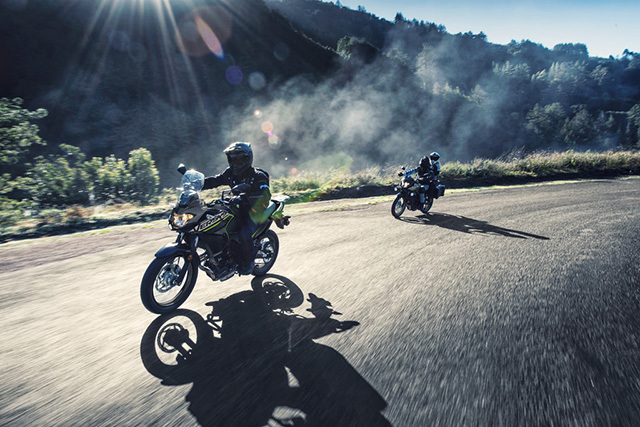 The light clutch lever pull and easy control afforded by the Assist & Slipper Clutch greatly contributes to comfortable, stress-free riding - especially when spending long stints in the saddle. When the engine is operating at normal rpm the assist cam functions as a self-servo mechanism, pulling the clutch hub and operating plate together to compress the clutch plates. This allows the total clutch spring load to be reduced, resulting in a lighter clutch lever pull when operating the clutch. 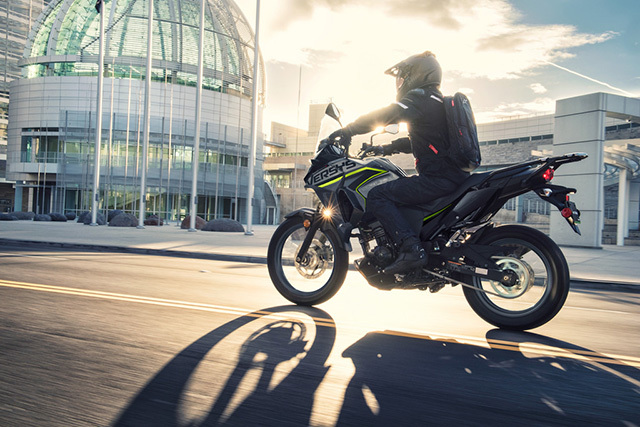 Large, double seat is on par with the seat of the Versys 650, offering excellent comfort. Complementing the rider's comfortable seat, a wide rear seating area and ergonomically sculpted grab bars deliver superior passenger comfort. The rear seat area is flat, and together with the rear carrier offers an excellent platform for securing luggage. 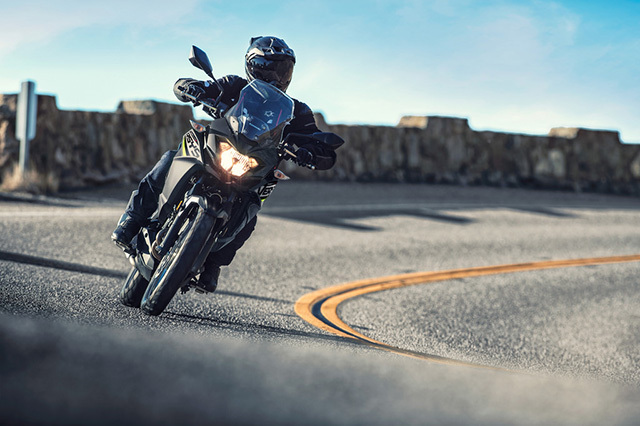 The Versys-X's slim, upright riding position and a wide handlebar offer high controllability as well as the comfort for long-distance riding. A relatively low seat height and a seat design that is slim at the front make it easy for a wide range of riders to easily reach the ground with their feet. Slim design of the 17-litre fuel tank makes it easier for riders to reach the ground with their feet. Large openings in the fairing promote airflow when riding to help dissipate engine heat. Patented radiator fan cover located behind the radiator directs hot air down and away from the rider, significantly increasing comfort when stuck in heavy traffic. Redirecting the air also helps keep the tank, frame and other parts that contact the rider cooler, further increasing rider comfort. 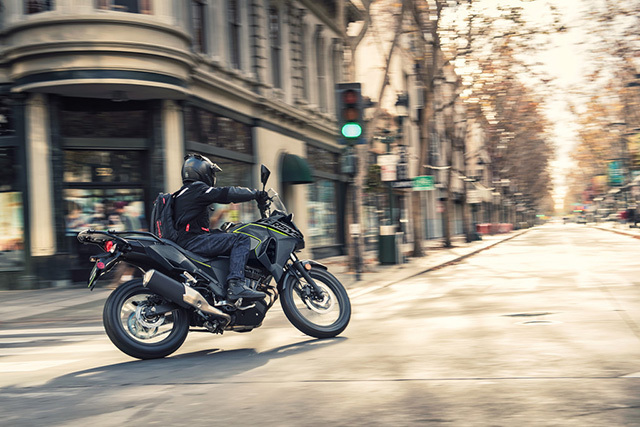 Large-volume bodywork and imposing adventure styling give the impression that the Versys-X is a much larger-displacement machine. In contrast to the street-focused Versys models, the rugged design of the Versys-X looks very much at home off the pavement. The Versys-X's long, tall upper cowl design was inspired by adventure models. A chin spoiler contributes to the sharp, aggressive Kawasaki image. 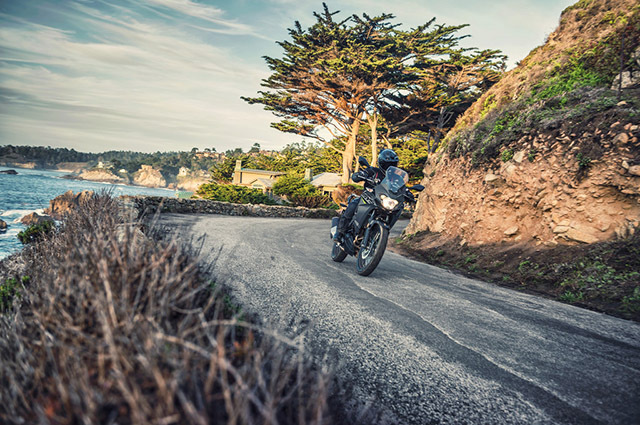 Rugged, high rigidity frame was designed to handle external disturbances, contributing to the Versys-X's unpaved-road capability. Frame's simple construction includes lightening holes, helping to keep chassis weight to a minimum. Area around the rear shock mount is reinforced, ensuring a high capacity to handle unpaved road situations. Rigid-mounted, the engine is used stressed member, contributing to both the frame's high rigidity and light weight. Rear frame was designed to be slim beneath the rider's seat, facilitating the rider's reach to the ground while maintaining necessary rigidity. Instrument panel layout features a large analogue tachometer flanked by warning lamps on one side, and a gear position indicator and multifunction LCD screen on the other gear position indicator - a first for a 300cc-class Kawasaki -increases shifting precision and confidence, while also contributing to a sporty image. In addition to the digital speedometer and gear position indicator, display functions include: odometer, dual trip meters, fuel gauge, remaining fuel range, current and average fuel consumption, coolant temperature, clock and the Economical Riding Indicator. The Economical Riding Indicator appears on the LCD screen to indicate favourable fuel consumption. Paying attention to conditions that result in the mark appearing can assist riders to maximise their fuel efficiency. This handy feature is active all the time, although to be effective, the rider must ride in a gentle manner. 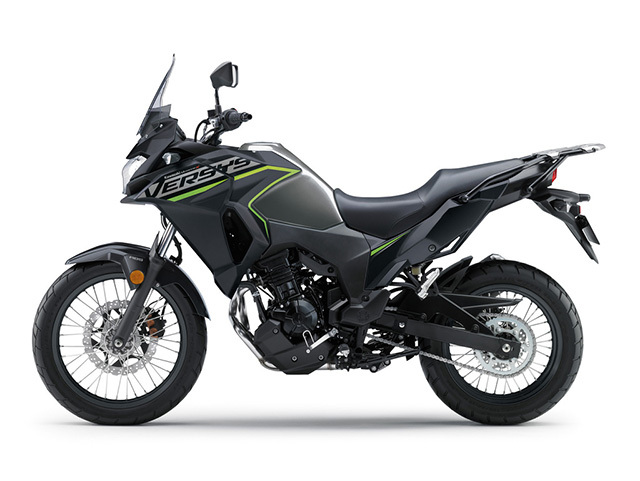 While the Versys-X was not designed for off-road use, 19" front and 17" rear spoke wheels give it greater capability on unpaved roads than its larger, street-focused brothers. The wire spoked wheels feature aluminium rims to help minimise unsprung weight. 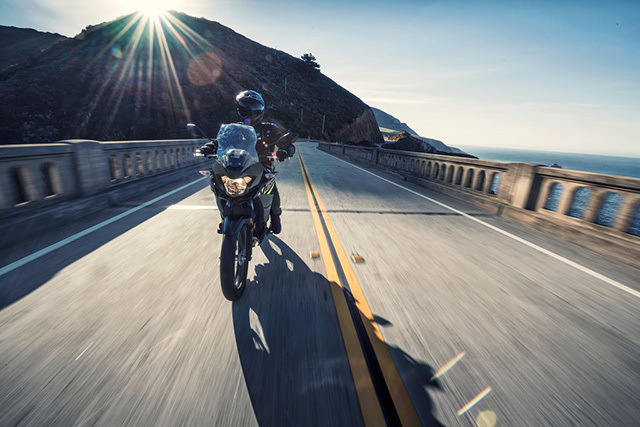 Using long-travel suspension enables the Versys-X to deliver riding excitement across a wide range of riding situations. Not all streets in the real world are made of circuit-smooth pavement. Road imperfections (bumps, potholes) are far from rare, and many streets are not even paved. The long-travel suspension is designed to easily soak up road imperfections, even when travelling on unpaved roads. Excellent feedback from the front end contributes to rider confidence and a high level of riding excitement, while the linked rear suspension offers both riding stability and ride comfort. 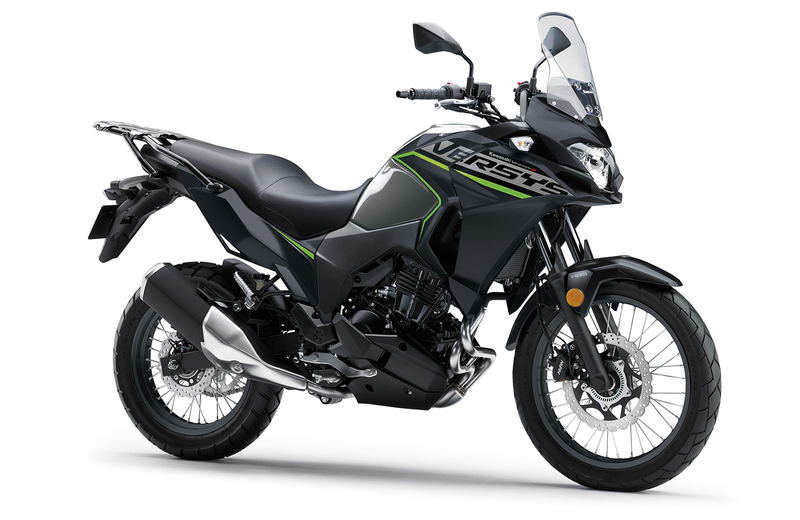 long-distance potential of the Versys-X. A wide range of optional accessories are available should riders wish to enhance their ride. Efficiently-tuned 296 cm3 Parallel Twin engine produces smooth, torquey power at low and medium rpm and powerful acceleration at high rpm. Smooth power delivery and strong low-end torque facilitate slow-speed manoeuvres, offering both a high level of control when making minute throttle adjustments and a gratifying rush of acceleration in the lower rpm ranges, while low vibrations care of a balancer, and ample top end offer comfortable highway cruising. The all-new highly rigid backbone frame was designed to handle external shocks, contributing to the VERSYS-X's unpaved-road capability. 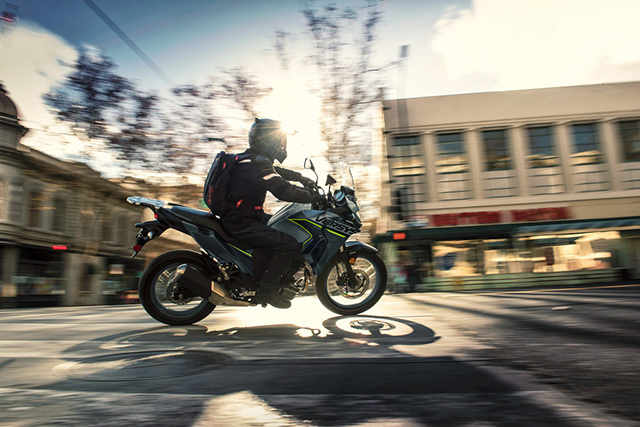 The sturdy frame is also able to support a passenger and optional luggage, making the VERSYS-X a very capable touring partner. 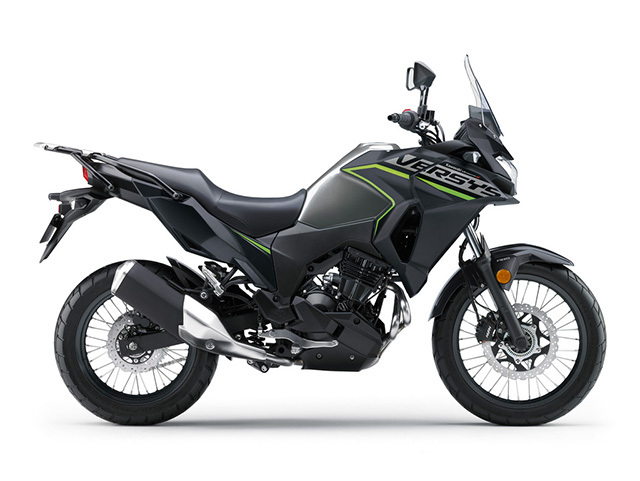 While the VERSYS-X was not designed for off-road use, 19" front and 17" rear spoke wheels give it greater capability on unpaved roads than its larger, street-focused brothers. Multi-purpose tubed tyres also contribute to capability on unpaved roads, while tyre tread pattern adds to the VERSYS-X's adventurestyle image. 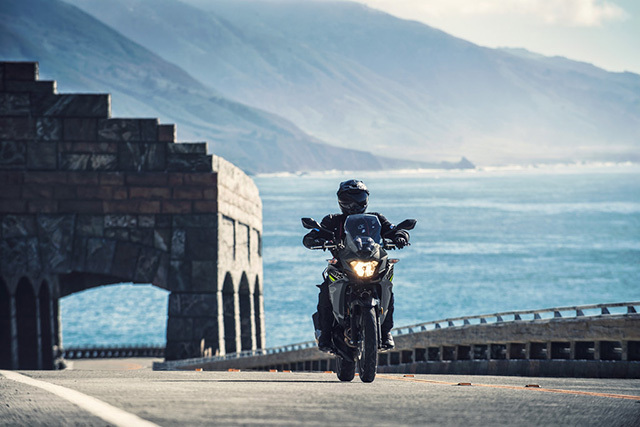 The VERSYS-X's large-volume bodywork and impressive adventure styling give it the imposing appearance of a much larger-displacement machine. In contrast to the street-focused VERSYS models, the rugged design of the VERSYS-X looks very much at home off the pavement. Suspension - rear Bottom-Link UniI-Trak with 5-way adjustable preload.